Every restaurant has to deal with food scraps, be it oily slop left over from cooking or the soup broth and other food left behind by customers. In China, some companies have taken even these unwanted morsels as an opportunity for profit. On May 9, North News in China’s Inner Mongolia region reported that of 200 to 300 tons of kitchen slop produced in the 3 million-strong city of Hohhot, only about 60 tons were being legally repurposed to produce aviation fuel. It is feared that the rest is reused in products that end up on dinner plates—in pork feed, and cooking oil. 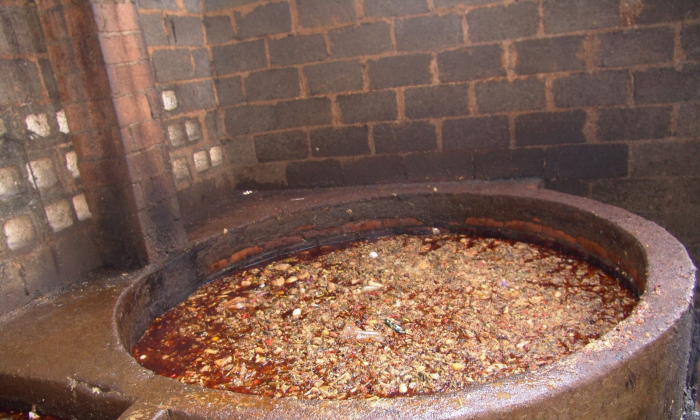 Although Hohhot has a municipal environmental company that takes restaurant slop free of charge to be processed, many establishments have found it more profitable to sell the fetid wastewater and leftovers to local collectors and redistributors. According to Liu Minghua, an employee at the environmental company, this problem has existed since at least 2015. Many restaurants only turn over a “symbolic” amount to the company, Liu told the local Inner Mongolia Morning News. According to North News, slop not given up to the state environmental company may be resold to pig farms and used as cheap fodder, or reprocessed into common cooking oil for unsuspecting consumers. Leaving aside squeamishness at eating other people’s half-eaten leftovers, restaurant slop often contains non-food substances like kitchen detergent. Slop is also dangerous when used as pig fodder, as it contains significant traces of aluminum and lead, in addition to being laden with bacteria, the Henan Business daily reported. The pork itself poses a health risk. It’s unknown how much of Hohhot’s kitchen slop is recycled in this manner, but the business is profitable, said Fu Ming, head of the municipal environmental company, in an interview with North News. Restaurants can make enough money to pay multiple employees with the food garbage, he said.